The Sorcerer’s Apprentice is formulaic and predictable, but it’s also fun and endearing. Director Jon Turteltaub and star Nicolas Cage, who teamed up for the National Treasure movies, once again keep things strictly PG in this family-friendly adventure flick that, yes, was “inspired by” the Mickey Mouse segment from Disney’s 70-year-old Fantasia, which in turn was inspired by a centuries-old poem by Goethe. Thrown into the movie’s cauldron of goofy, quirky creativity is a little musical interlude involving magically-conjured mops and lots of water that pays tribute to those earlier misadventures in sorcery. The action begins 1,000 years ago. Merlin’s three apprentices, Balthazar Black (Cage), Veronica (Monica Bellucci, Shoot ‘em Up), and Maxim Horvath (Alfred Molina, Prince of Persia: The Sands of Time), battle it out with one witchy woman named Morgana (Alice Krige, Reign of Fire). Morgana wants to master a magic spell called “The Rising,” which would allow her to raise the dead and take over the world (after all, it is summer, the season when megalomaniacs rule the cinemas). Through all sorts of wizardry and hocus-pocus, all but Balthazar wind up having their souls trapped in a nesting doll. That leads Balthazar to go solo on his next mission: to find Merlin’s successor. The opening prologue quickly runs through this back story; it’s an ambitious, expansive piece of filmmaking that feels like highlight clips from a previous feature-length installment. It continues on to show Balthazar’s travels through the centuries and around the world while looking for the next true sorcerer, called the Prime Merlinian. Merlin’s dragon-shaped ring will know its proper owner, so the story goes. That epic quest leads to New York, the year 2000, and the movie’s most shameful gaffe: the camera faces south, with the Empire State Building clearly in view, but there’s no World Trade Center further down the skyline. If they had moved south and pointed the camera north, they could’ve shown the Empire State Building and Central Park in the distance, thereby skirting the issue altogether. Or they could’ve set the year as 2002. But they didn’t. Regardless, that’s when a kid named Dave Stutler enters the picture and first meets Balthazar at an antiques shop called Arcana Cabana. The dragon ring takes a liking to li’l Dave, but he’s a klutz and one big boo-boo jars Horvath loose from the babushka. Even so, by the time Dave leaves the shop, Balthazar and Horvath are imprisoned in a large urn. Obviously it’s not all fun and games in the world of wizardry. As legend has it, they’ll be stuck there for 10 years. When it comes to magical stuff like this, there’s no point in questioning. Just roll with it. Fast forward to 2010. Dave’s all grown up and has taken the guise of Jay Baruchel (Tropic Thunder). He’s still a dork; actually, he’s still scarred by the events in that shop. And, unfortunately for him, once Balthazar and Horvath are released from the urn, they seek him out to track down the babushka. Once again, Dave’s life is not his own. Once the movie settles in with the players in place, its playfulness and charms begin to shine. Things like Persian quick rugs, magic books, and Tesla coils all factor into Balthazar’s whimsical world. While Balthazar tries to school Dave in the ways of sorcery, Horvath finds a magician with a little more immediate street cred and enlists Drake Stone (Toby Kebbell, RocknRolla) to help him rescue Morgana from the babushka and, ultimately, raise the dead. Drake’s an ancient spirit as well, but he’s enjoying his gig as a British showman magician, like Criss Angel and his lot. The story also strongly plays up the love angle, in a refreshingly clean PG fashion. There’s Balthazar’s love for babushka-entrapped Veronica. And, more at the fore, there’s Dave’s long-standing crush on Becky Barnes (Teresa Palmer, Bedtime Stories). It’s easy enough to see why Dave loves her. She’s a beautiful blonde who’s hip, pretty sharp, and a DJ at the college radio station. Plus, she thought he was cool 10 years ago, at least before that episode at Arcana Cabana ruined Dave’s nascent life. All the wiz-bang CGI special effects aside, The Sorcerer’s Apprentice never takes itself too seriously and offers up plenty of good-natured, self-deprecating humor that acknowledges the farce on hand. For example, as any sorcerer knows, when dealing with things like urns and babushkas, it’s best to wear generic “old man’s shoes,” since the rubber soles of gym shoes dissipate the sorcerer’s energy-channeling abilities. And the movie is blessed with some extra charm thanks to the genuine likability of the lead protagonists. Cage, Baruchel, and Palmer carry the ludicrous story on their shoulders, lifting it up to a level of palatability that might not have been the case otherwise. But that’s not to say the movie works well from start to finish. 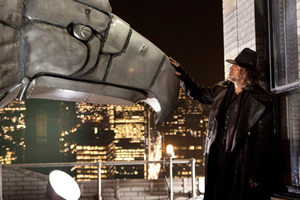 It’s cool to see Balthazar bring one of the Chrysler Building’s eagle gargoyles to life and fly it around the city. But it’s not cool seeing poor Becky, who has a chronic fear of heights, make her way up to the top of a skyscraper, go outside, and dislocate a satellite dish. That’s faulty logic on a number of levels. Regardless of whether the location happens to be the Empire State Building or the Chrysler Building, the movie’s characters step outside at the summit of these landmarks with an exceptional amount of freedom that hurts the head regardless of all the surrounding sorcery and magic tricks. As it stands, the gleefully fanciful and light-handed storytelling might be out of place in this cynical era of potty-mouthed children and ultraviolent onscreen action. There’s a storytelling sensibility here that feels like it might’ve been more at home back in the 1980s, when movies with similar tones and themes, like Back to the Future, Gremlins, and Ghostbusters, were hugely popular.